The International Organization for Migration has a long standing and extensive working relationship with the United Nations (UN) at several levels. Today, there are three formal elements on which IOM's overall relationship with the United Nations is based. The first is the observer status in the UN General Assembly, which IOM obtained in 1992 (GA resolution A/RES/47/4). 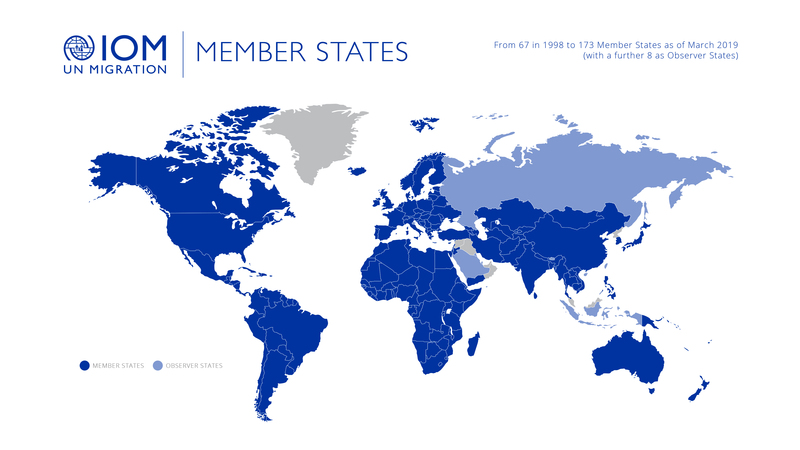 The second is IOM's inclusion by the General Assembly as a "standing invitee" in the Inter-Agency Standing Committee (IASC) which also started in 1992. The third element is the Cooperation Agreement between IOM and the UN, which was signed in 1996 and provides a formal basis for a closer collaboration between the two secretariats. In practical terms, the increasing operational collaboration that has evolved over the past decade and a half between IOM and a broad range of UN entities has also resulted in more frequent ad hoc inclusion of IOM in relevant UN working groups. This has especially been the case in emergency and/or post-conflict rehabilitation situations, but also extends to a number of ongoing consultative processes, e.g., on women and gender equality. In addition, IOM's Permanent Observer Office in New York maintains ongoing active liaison with the United Nations Secretariat, notably the Office for the Coordination of Humanitarian Affairs (OCHA), the Department of Economic and Social Affairs (UN DESA), the Department of Peace-Keeping Operations (DPKO) and the UN Department for Safety and Security (UNDSS), in order to provide information about IOM's policies and activities, and to advise on substantive matters related to the Organization's fields of expertise. The Office of the Permanent Observer also fosters the exchange of information with New York-based United Nations bodies, such as the United Nations Population Fund (UNFPA), the United Nations Children's Fund (UNICEF) and the United Nations Development Programme (UNDP) on matters of mutual concern. Memoranda of Understanding (MoUs) have been signed with many of them which govern the particular fields and details of the cooperation. The Office also represents IOM at various working groups set up by the United Nations Development Group (UNDG) and OCHA. Since the Organization joined the United Nations System in September 2016, IOM Chiefs of Mission participate in UN Country Teams (UNCTs) as official members. Field missions maintain close working relationships with UN partners; the United Nations High Commissioner for Refugees (UNHCR), the International Labour Organization (ILO), the United Nations Children's Fund (UNICEF), the World Food Programme (WFP); the United Nations Development Programme (UNDP) and the Joint United Nations Programme on HIV/AIDS (UNAIDS) being some of the most prominent among them. Cooperation includes joint organization and execution of programmes and activities, close coordination and the provision of complementary services. The introduction of the "cluster approach" has incorporated IOM even more firmly in the Inter-Agency Standing Committee (IASC). It presents an opportunity for the humanitarian community to highlight the unique characteristics of each organization and capitalize on their strengths. IOM has taken on the lead role for the Camp Co-ordination/Camp Management Cluster (CCCM) in natural disasters and also plays a critical role in various other clusters including shelter and logistics. IOM's collaboration with the UN system and its agencies is further strengthened by its membership in the Global Migration Group (GMG), an inter-agency group, meeting at both the working level as well as at the level of heads of agencies. The GMG aims to promote the wider application of all relevant international and regional instruments and norms relating to migration, and the provision of more coherent and stronger leadership to improve the overall effectiveness of the international community's and United Nation's policy and operational response to the opportunities and challenges presented by international migration. The GMG grew out of an existing inter-agency group, the Geneva Migration Group, which was established in April 2003 by the heads of IOM, the International Labour Organization (ILO), the Office of the United Nations High Commissioner for Human Rights (OHCHR), the United Nations Conference on Trade and Development (UNCTAD), the Office of the United Nations High Commissioner for Refugees (UNHCR) and the United Nations Office on Drugs and Crime (UNODC). In early 2006 membership in the Geneva Migration Group was expanded to include United Nations Department for Economic and Social Affairs (UNDESA), United Nations Development Programme (UNDP), United Nations Population Fund (UNFPA) and the World Bank. The Geneva Migration Group's Terms of Reference were updated, and it was renamed the "Global Migration Group". In November 2007 the GMG admitted a further four members – the United Nations Educational, Scientific and Cultural Organization (UNESCO), the United Nations Children's Fund (UNICEF), the United Nations Regional Commissions and the United Nations Institute for Training and Research (UNITAR). In 2010, the World Health Organization (WHO) and the United Nations Entity for Gender Equality and Empowerment of Women (UN Women) were admitted as members, bringing the total GMG membership to 16 agencies.